We tend to think of alstroemerias as a mainstay of the traditional or mixed herbaceous border, where these tall tuberous perennials with their flecked and striped flowers provide an exotic and exuberant display for many months from June until the first frosts. They are free-flowering and surprisingly easy to grow (although their roots resent disturbance) and combine well with other plants. Strangely, every plant wears its leaves upside down, each leaf stalk having a twist in it that brings what should have been the underside of the leaf uppermost. They originate from Chile, and are commonly called the Peruvian or Princess Lily - maybe Chile Lily didn’t have quite the right connotations for such a dramatic and colourful flower! Seeds from A. pelegrina were sent to Linnaeus in 1753 by a fellow compatriot Baron Claes Alstroemer of Sweden, and the story goes that Linnaeus was so anxious to preserve this new species that during the cold of the winter he kept the seedlings in his bedroom. 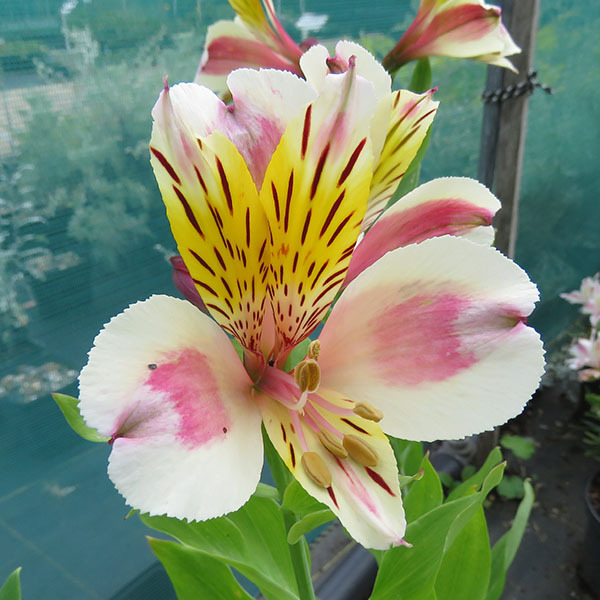 Most of the early alstroemerias were greenhouse varieties, and although there were various species available it was not until the 1930’s that the hardier Ligtu hybrids were developed (Ligtu being the Chilean name for the flower). Now through more selective breeding there are many new varieties available including the wonderful ‘Little Miss’ compact series which grows to about 45cm and is great for the front of a border or for a container on the patio. It flowers abundantly and is a great all-rounder (and perfect as a cut flower). Little Miss varieties come in a wide range of colours, although that great plantswoman Vita Sackville-West, when speaking of alstroemerias, said “Keep the orange away from the coral, for they do not mix well together, and whoever it was said Nature made no mistakes in colour harmony was either colour-blind or a sentimentalist. Nature sometimes makes the most hideous mistakes; and it is up to us gardeners to control and correct them.” Whether you heed her advice or not the alstroemeria is the perfect choice for easy, trouble-free summer colour.